Two things that I really enjoy are coming together. 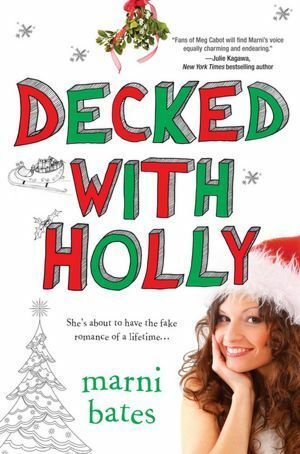 The first is author Holly Black. Her Curse Workers trilogy is absolutely genius (oh hey, feel free to check out my reviews of White Cat and Red Glove). The second thing is creepy middle grade along the lines of The Cavendish Home for Boys and Girls. Black’s forthcoming book (illustrated by Eliza Wheeler) sounds amazing, and I can’t wait to read it. 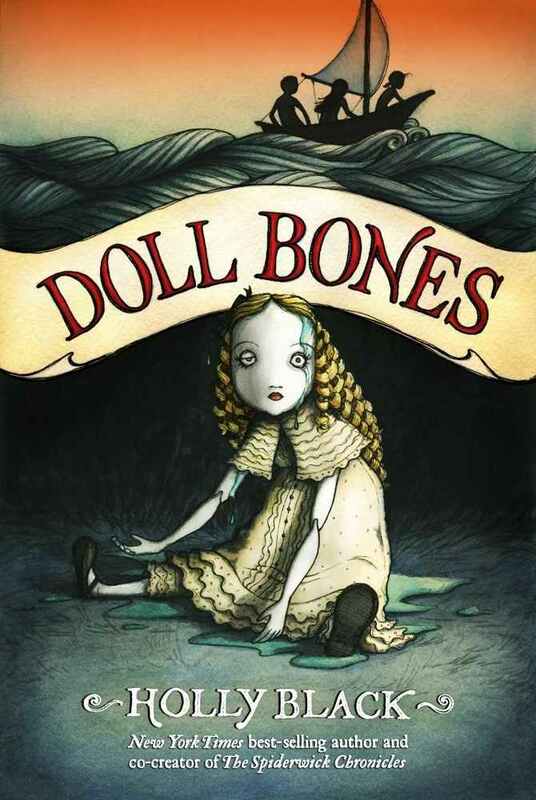 Doll Bones will be released on May 7, 2013 by Margaret K. McElderry Books (Simon & Schuster). Most of my favorite reads claimed that status long before I began blogging, but there are some wonderful exceptions to that trend, including Sharon Shinn’s angel series. A couple of years ago I participated in the Horns & Halos Reading Challenge, and I tried Archangel and then all the rest – as fast as I could get them. The mix of subtle sci-fi elements, angel mythology, symbolism and romance made me a Shinn fan. Last year I saw notes here and there about her latest release, The Shape of Desire, but it wasn’t until the sequel (Still Life with Shapeshifter) started showing up on my Amazon ‘Recommended for Cecelia’ list that I got serious about reading the first entry in this new series. I borrowed the book from the library and read it in one night. The Shape of Desire wasn’t what I expected, but I don’t think I’ll ever be impervious to a Sharon Shinn romance. Maria has been in love with Dante for almost half of her life. She keeps him secret and she keeps him safe. This is because Dante is a shapeshifter, and his anonymity is synonymous with his safety. However, when a series of murders shake her area, Maria isn’t sure what to do, where the boundaries lie in her relationship (is she in danger? are others? ), or how deep the secrets go. 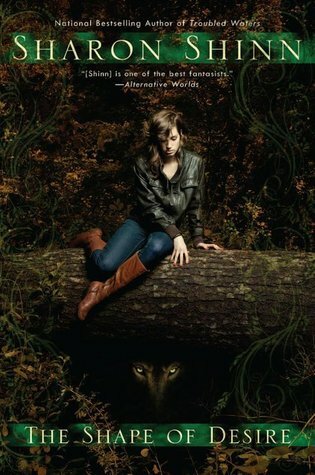 While the presence of a shapeshifting character marks this book as a fantasy (and a paranormal fantasy at that), it reads much more like realistic contemporary fiction. As Maria herself points out several times, Dante could simply have a very mysterious job – as a CIA operative, perhaps. The same book could exist with a spy at its core rather than a shapeshifter. With that said, I think Shinn’s treatment of the shapeshifting element is a highlight – there is no glorification of it, and very little beauty to be found. Instead, the life of a shapeshifter is one of danger, of brevity, and of uncertainty. At its heart, The Shape of Desire is a romance. It’s a story of individuals making insane choices in order to live with each other, and the inherent peril in those decisions. The romance is fleshed out with office gossip, family relationships, and the very mundane details of life. The gripping parts, the bits that keep you reading, are the threads of secrets, the theme of protecting family and protecting self, and a mature understanding of love and romance. On the downside, there’s not a lot of ‘action’ on the surface. This is about humanity, about emotional survival, about the toll of living with secrets. The book will appeal to those with patience to unravel a character-driven story, but probably not those used to rip-roaring plots. It’s a quiet, adult book (despite what the cover would lead you to believe). I wasn’t expecting it, and it won’t be an all-time favorite, but I admired the furious-movement-beneath-still-water feel of Shinn’s writing and the unique take on a common paranormal creature. Recommended for: those who appreciate character-driven stories with a slow build towards conflict, and anyone curious to see how a seasoned fantasy and sci-fi author will approach a well-worn paranormal trope. I originally posted this recipe in August 2009. This time around I’ve substituted unsweetened cocoa powder (times two!) for chocolate squares, and managed some nicer photos. When I was quite little I remember my mother making sugar cookies by the dozen, and sharing them with friends and family. After a while, she had too many energetic children underfoot to do a big holiday baking spree, and that tradition lapsed. When I got old enough to start helping with the fudge and Christmas breakfasts, we reinstated some holiday-esque cookie baking, and this recipe has always been a huge hit. It’s chocolate to the max, and a bit like a brownie in cookie form. I end up making it almost every year for cookie exchanges or a holiday dessert contribution. Mix flour, baking powder and salt in large bowl. Set aside. In saucepan, stir butter, oil and chocolate over low heat until melted and smooth. When cool, stir in 1 cup sugar, eggs, vanilla and nuts; mix until blended. Add chocolate mixture to flour mixture, stir until blended. Cover and chill 1 1/2 to 2 hours, until firm (or flash cool in freezer for 30 minutes). Preheat oven to 300˚F. Roll into 1-inch balls; then roll in extra sugar. Place 2 inches apart on ungreased baking sheet, and bake for 18 to 20 minutes or until tops are crackled and slightly firm to touch. Serve immediately, store in an airtight container for up to a week, or freeze. Yields approximately 24 cookies. Recommended for: a rich, chocolate-y addition to any holiday cookie exchange, the perfect baked good for the cocoa addict in your life, and for anyone who claims they love brownies above all else (it might just change their minds!). As a kid I loved historical fiction, and especially WWII fiction. I also read (for myself first and then for school) The Diary of Anne Frank and Corrie ten Boom’s The Hiding Place. These nonfiction first-hand accounts showed not only the immediacy of war, but also the personalities of those who survived it and found ways to thrive amidst terrible events. You had to be inspired by the intelligence and humanity of these women, writing and telling stories and falling in love or doing what was right, no matter how hard. I’ve recently found another inspiring and entertaining first-hand account from the WWII era in Joan Wehlen Morrison’s Home Front Girl: A Diary of Love, Literature, and Growing Up in Wartime America. This diary of a smart, astute, and funny teenager provides a fascinating record of what an everyday American girl felt and thought during the Depression and the lead-up to World War II. Young Chicagoan Joan Wehlen describes her daily life growing up in the city and ruminates about the impending war, daily headlines, and major touchstones of the era—FDR’s radio addresses, the Lindbergh kidnapping, Goodbye Mr. Chips and Citizen Kane, Churchill and Hitler, war work and Red Cross meetings. Included are Joan’s charming doodles of her latest dress or haircut reflective of the era. Home Front Girl is not only an entertaining and delightful read but an important primary source—a vivid account of a real American girl’s lived experiences. Joan Wehlen Morrison was a girl of 14 in 1937 when this selection of her diary starts, and it continues through her adolescence until 1943, the year she married. She writes of school assignments, reading, friends, family, boys, world events and the lead up to war and then the reality of it. From her home in Chicago, the reader sees through Joan a vision of America during wartime as it was ‘at home.’ Her intellectual curiosity, humor and facility with language mark this diary not only as an important historical record, but a superb read as well. 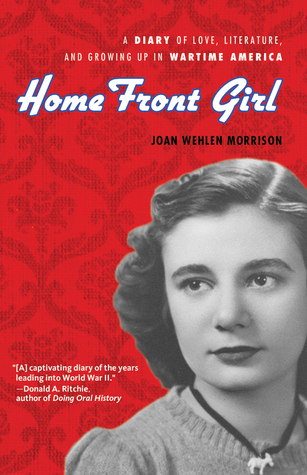 Home Front Girl exists because Joan’s daughter, Susan Signe Morrison, found Joan’s diary amidst her papers after her death in 2010. The book contains a portion of the entries she wrote in the years mentioned, only edited in punctuation and spelling (with a footnote here and there for the reader who doesn’t pick up on allusions or historical events). There are snippets of Joan’s little illustrations, along with photos of her and examples of her writing. Of course, not all diary entries are equal. Joan wrote not only observations, but poetry, philosophical meanderings, calls to her generation – and about lipstick, bridge, and dates. She was a very intelligent girl and then woman, and her mind was an active and beautiful thing, no matter her topic. Recommended for: anyone who has wanted to get inside the head of an American young person during WWII, and those who enjoyed The Diary of Anne Frank. Would you like to win a copy of Home Front Girl? The publisher has kindly offered one hardcover copy to a reader with a US mailing address. If you'd like to enter, simply fill out the FORM. Giveaway will end on December 27th at 11:59pm EST. Winner will be selected randomly and notified via email, book will be mailed by publisher. Good luck! Fine print: I received a copy of Home Front Girl for review from IPG and Chicago Review Press. Giveaway book provided by the same. I received no compensation for this post. Every time I check one of the ‘Upcoming Trends in 2013’ articles, I am excited to see YA sci-fi experiencing a surge of popularity. While dystopian has been hot for a few years now, sci-fi set in space is a great little sub-genre, and I think it deserves the attention (and an update!). When I saw the cover and synopsis for one of the hot releases of 2013, I knew I had another addition to the to-be-read pile. 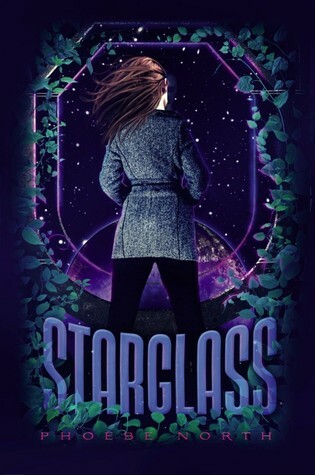 Phoebe North’s Starglass will be released on July 23, 2013 by Simon & Schuster Books for Young Readers. Sixteen-year-old Terra’s situation is tough. A dead mom. A grieving dad. A bitchy boss, and a betrothed who won’t kiss her no matter how bad she wants it. She’s doing her best to stay afloat, even when she gets assigned a vocation she has no interest in: botany. One of the serious benefits of book blogging is that it prompts me to venture outside of my reading comfort zone. I could be very happy simply rereading my current book collection again and again. Instead, I read about my fellow bloggers’ new favorites. Blogging introduces me to the latest releases, new favorite genres, and allows me to connect with fresh genius. Listed below are the best of the crop of the authors I read for the first time in 2012. 1. Sarah Prineas (Winterling) – Prineas’ winter fairy tale reminded me of the fantasy adventures that prompted my first interest in genre. 2. 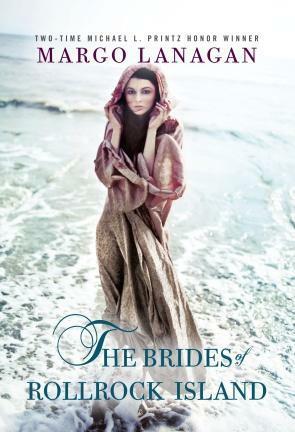 Margo Lanagan (The Brides of Rollrock Island) – I expected too much going into the reading experience, so my first Lanagan book didn’t shine as much as promised. I was impressed by the writing, though, and I’ll be back for more. 3. Cath Crowley (Graffiti Moon) – Crowley is a master at writing relationships, and delineating hopes, dreams and the awkward/sweet/angry that is teenage life. 4. Ellen Potter (The Humming Room) – Potter’s retelling of The Secret Garden was, simply put, enchanting. 5. Maryrose Wood (The Incorrigible Children of Ashton Place: The Mysterious Howling) – Oh, how I love funny, clever middle grade! 6. Claire Legrand (The Cavendish Home for Boys and Girls) – Again on-trend with my middle grade obsession, this one sent chills down my spine and delighted the child inside. 7. Leah Bobet (Above) – Bobet wrote a complicated, twisty story that combined fantasy and mental illness, and the fact that the concept actually worked in practice was a feat! 8. Geoff Herbach (Stupid Fast) – Felton is, hands down, my favorite character of the year. Herbach is genius. 9. Erin Bow (Plain Kate) – The sorrow and beauty and loneliness of Bow’s first novel snared my heart and then squeezed it dry. I shall read everything she writes. 10. Frank Cottrell Boyce (Cosmic) – A witty, self-aware and nerdy take on sci-fi will get me every time. Who were your favorite new-to-you authors this year? 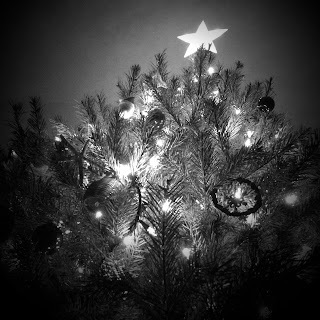 Christmas used to be my favorite holiday, hands down. Along the way, though, Thanksgiving started to creep higher in my affections, and now it’s hard for me to say which one I prefer. This is because everyone in my extended family is cuckoo for food prep, setting the table, dressing to the nines, and generally making a BIG DEAL out of it. I love that. I love making my two pies the day before and then putting an apron on over my sparkly dress and becoming a sous chef and dishwasher. It’s amazing to see the passion for food, the love poured into a meal and a tradition so that we can all sit down to a dazzling spread on Thanksgiving. With that said, we’re not complete traditionalists. 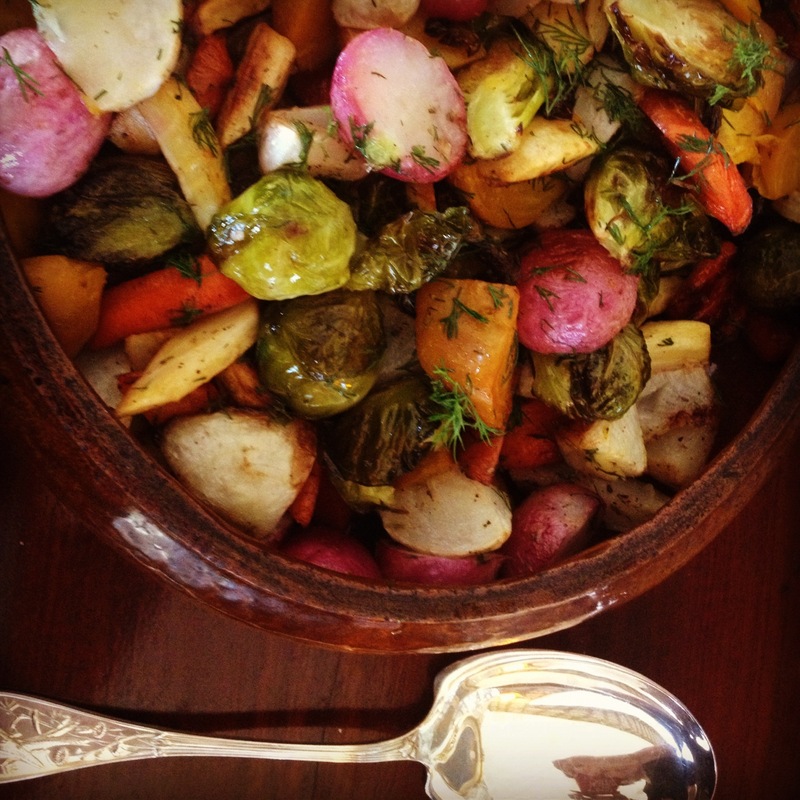 Dishes come and go as guests rotate, and this year for the first time we did a roasted root vegetable side dish. It was so delicious and beautiful that I had to document it for its own sake, and I’ll be replicating it for the Christmas dinner I plan yearly with my girlfriends. Rub beets with olive oil and envelop in aluminum foil. As soon as oven is hot, place inside to roast separately. You’ll know they’re done with a fork slides into beet easily. Cut the remaining vegetables into 1-inch cubes – don’t cut too small, as they’ll shrink while roasting. Place all cut vegetables in a single layer on 2 baking sheets, drizzle with olive oil, and sprinkle with salt and pepper. Toss well to coat. Bake for 45 minutes, turning once midway through with a spatula. Remove from oven, cut up beets and add to mixture, and sprinkle with dill and oregano. Toss to mix in herbs, and serve hot. One note: the radishes may bake faster than the rest of the vegetables – be sure to test their readiness at the halfway point. If done early, pick them off the baking sheet and let the rest finish roasting. Recommended for: a colorful and delicious accompaniment to any winter meal, a side of vegetables that you’ll want to eat for tomorrow’s lunch, and a dish that will tempt the veggie-averse. It’s holiday time, there are lights up everywhere, we’ve had a day or three of cold weather here in DC, and I have procured and decorated a Christmas tree. No matter what holidays you celebrate (or do not celebrate) this month, books are the answer. That’s why I’m hosting a giveaway. Yes, a lovely, choose-your-own-gift sort of giveaway! Three winners will each receive a book of their choice (up to US$30 – that should cover any hardcovers or audiobooks you may want to get your hands on) from Amazon or The Book Depository. To enter, simply fill out this FORM. Giveaway open internationally, will end December 20, 2012 at 11:59pm EST. Winners will be selected randomly and notified via email. Good luck! If you’ve ever taken a look at my ‘Recipes’ tab, you’ll know that I have a bit of a food obsession. I like making it, eating it, and especially feeding it to my friends. I follow food blogs, subscribe to food magazines, and regularly participate in Beth Fish Reads’ Weekend Cooking feature. A book that focuses on food is one of the best things ever, for it combines my loves of food and reading. 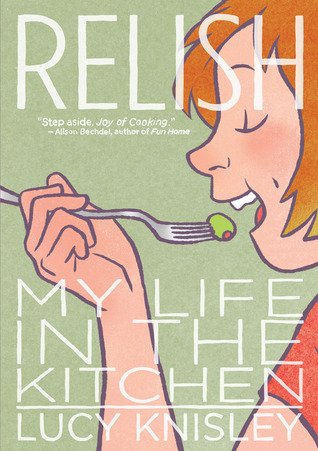 Cartoonist Lucy Knisley’s graphic novel memoir, Relish: My Life in the Kitchen will be right up my alley. Relish will be released on April 2, 2013 by First Second (Macmillan).